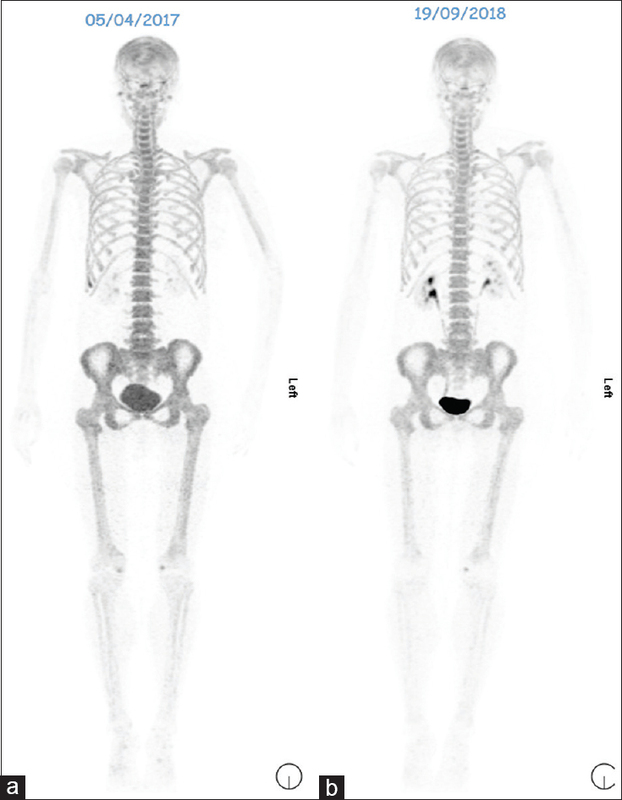 99m Tc-methylene diphosphonate (MDP) bone scan has been the standard method for nuclear medicine imaging of the skeleton for decades, providing information about the presence, extent, location, and response to treatment in patients with osseous metastasis. For better resolution and characterization, up to 20 mCi or more of tracer is required and still higher doses are required for obese population, leading to higher radiation burden and secondary increased risk of cancer. Currently, bone imaging is a part of oncology workup as a pretreatment staging; however, an interim and end-of-therapy scan is also advised for response evaluation in metastatic bone disease, leading to a cumulative absorbed doses of approximately 18–19 mSv for a given line of treatment. It is well known that cancer risk is induced from radiation., Lifetime attributable risk of cancer incidence, according to the principles of the National Academies' Biological Effects of Ionizing Radiation Report VII, was calculated to be between 0.231% and 0.514% for 20-year-old females and between 0.163% and 0.323% for 20-year-old males. Segall et al. suggested a fixed-dose method of imaging dose of 18 F-NaF, that is, 185–370 MBq (5–10 mCi) in 2010 in procedure guideline of SNMMI. The fixed-dose method varied from physician to physician, leading to a lack of standardized formula for NaF imaging till date. The effective absorbed doses by this fixed method came out to be even higher than the 99m Tc MDP bone scan, that is, 0.024 mSv/MBq (0.089 mrem/mCi) or 4.44 mSv–8.88 mSv, for an average 70-kg man for the above-mentioned dose range [Table 1], leading to approximately 17% higher exposure than the exposure reported for 99m Tc-MDP, that is, 4.21 mSv–6.32 mSv for a typical activity of 740–1110 MBq (20–30 mCi). Keeping in view the same issue, Ohnona et al. imaged 40 patients according to EANM and SNM guidelines and reported in 2013 that the dose of 18 F-NaF may be lowered without major untoward effect on image quality by reducing the injected activity (e.g., by about half) such that the effective dose would then be comparable to that for 99m Tc-MDP. Further refinement of the idea was done by Lim et al. who reported that the radiation dosimetry for 18 F-NaF PET is similar to that with 99m Tc-MDP imaging, and good-quality 18 F-NaF imaging can be effectively performed using a smaller administered dosage than is typically employed for MDP, resulting in an actual radiation absorbed dose that is equivalent to that received from standard single-photon imaging. Chilton et al. reported that the total uptake of 18 F-fluoride by the bone is similar to that of 99m Tc-MDP, at approximately 50% of the injected dose. Considering the imaging point of view, the soft-tissue half-value layers for the 511- and 140-keV photons are 7.3 and 4.6 cm, respectively; it means that 511-keV photons can deliver their energy to organs distant from the source organ, making imaging better, whereas the 140-keV photons will deliver more of their energy to organs near the source organ. Keeping in view the inference of Ohnona et al., Lim et al., and Chilton et al., we performed prospective 18 F-NaF imaging in 6000 patients from January 2012 to December 2016. 1062/6000 were included in evaluation of low-dose NaF study standardizing the imaging dose as 0.06 mCi/kg  followed by a prospective study of 212/6000 morbidly obese patients for evaluation of the effect of body mass index (BMI) in 18 F-NaF imaging. Prospective imaging data of a large cohort of 1062 patients by Marafi et al. showed significant dose reduction keeping the imaging quality at acceptable levels, which is in accordance with the already published results of Ohnona et al. Good-quality 18 F-NaF imaging was seen at the lowest dose standards of 0.06 mCi/kg for all age groups excluding the pediatric population [Figure 1]. Recently published data of Usmani et al. have given an excellent imaged-based crispy outlook in morbidly obese patients (up to 66 kg/m 2 BMI) where they showed that 18 F-NaF imaging can be done in all age groups without altering the diagnostic accuracy of bone images. These results are also in concordance to results published by Chilton et al. where they suggested that NaF uptake is similar with MDP bone uptake at as low as 50% of injected dose. This is not possible with MDP where image deteriorates as there is an increase in BMI. It is obvious from [Table 1], that the absorbed doses for maximum I.D. are 5.7 mSv for Kuwait Cancer Control Center (KCCC) protocol. When compared to the exposure imparted by SNM guidelines for maximum I.D., the exposure by KCCC guidelines is 69.14% and 67.45 % lower than then the exposure imparted by the 18F-NaF and 99mTc MDP, respectively. Similarly, by following KCCC protocols, the dose exposure is 12% and 14 % lower than the EANM recommended injected dose range of minimum and maximum, respectively i.e. (1.5–3.7 MBq/kg). This work is also supported by SKELETA clinical trial conducted by Jambor et al. who report that 18 F-NaF PET-CT is more sensitive, accurate, and has less equivocal findings than 99m Tc hydroxymethylene-diphosphonate planar (99m Tc-HDP) bone scintigraphy,99m Tc-HDP single-photon emission tomography (SPECT), and 99m Tc-HDP SPECT-CT for the detection of bone metastases in high-risk breast and prostate cancer patients. 18 F-NaF, a lost and found molecule, has time-proven potential for evaluation of bone diseases. In the light of the above data, we infer that through proper tailoring of injected doses of NaF, high-quality imaging can be achieved keeping the injected doses at minimum levels. Here, we suggest a new standard for adult bone imaging dose of 0.06 mCi/kg for 18 F-NaF based on the recently published data. Keeping in view the potential of 18 F-NaF, due to its unique in vivo chemistry, we suggest to update the current available guidelines of 18 F-NaF adult bone imaging in nuclear medicine. 1990 recommendations of the international commission on radiological protection. Ann ICRP 1991;21:1-201. Committee to Assess Health Risks from Exposure to Low Levels of Ionizing Radiation, Nuclear and Radiation Studies Board, Division on Earth and Life Studies, National Research Council of the National Academies. Health Risks from Exposure to Low Levels of Ionizing Radiation: BEIR VII Phase 2. Washington, DC: National Academy Press; 2006. Huang B, Law MW, Khong PL. Whole-body PET/CT scanning: Estimation of radiation dose and cancer risk. Radiology 2009;251:166-74. Langsteger W, Rezaee A, Pirich C, Beheshti M. 18F-naF-PET/CT and 99mTc-MDP bone scintigraphy in the detection of bone metastases in prostate cancer. Semin Nucl Med 2016;46:491-501. Grant FD, Fahey FH, Packard AB, Davis RT, Alavi A, Treves ST, et al. Skeletal PET with 18F-fluoride: Applying new technology to an old tracer. J Nucl Med 2008;49:68-78. Segall G, Delbeke D, Stabin MG, Even-Sapir E, Fair J, Sajdak R, et al. SNM practice guideline for sodium 18F-fluoride PET/CT bone scans 1.0. J Nucl Med 2010;51:1813-20. 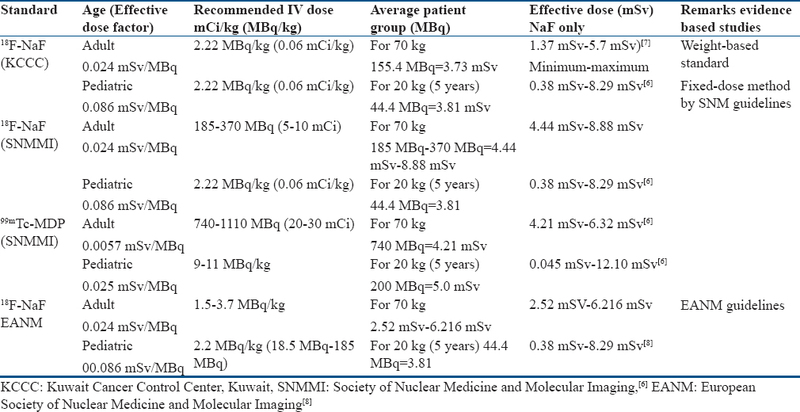 Marafi F, Esmail A, Rasheed R, Alkandari F, Usmani S. Novel weight-based dose threshold for 18F-naF PET-CT imaging using advanced PET-CT systems: A potential tool for reducing radiation burden. Nucl Med Commun 2017;38:764-70. Beheshti M, Mottaghy FM, Paycha F, Behrendt FFF, Van den Wyngaert T, Fogelman I, et al. (18)F-naF PET/CT: EANM procedure guidelines for bone imaging. Eur J Nucl Med Mol Imaging 2015;42:1767-77. Ohnona J, Michaud L, Balogova S, Paycha F, Nataf V, Chauchat P, et al. Can we achieve a radionuclide radiation dose equal to or less than that of 99mTc-hydroxymethane diphosphonate bone scintigraphy with a low-dose 18F-sodium fluoride time-of-flight PET of diagnostic quality? Nucl Med Commun 2013;34:417-25. Lim R, Fahey FH, Drubach LA, Connolly LP, Treves ST. Early experience with fluorine-18 sodium fluoride bone PET in young patients with back pain. J Pediatr Orthop 2007;27:277-82. Chilton HM, Francis MD, Thrall JH. Radiopharmaceuticals for bone and bone marrow imaging. In: Swanson DP, Chilton HM, Thrall JH, editors. Pharmaceuticals in Medical Imaging: Radiopaque Contrast Media, Radiopharmaceuticals, Enhancement Agents for Magnetic Resonance Imaging and Ultrasound. New York: Macmillan Publication Co.; 1990. p. 537-63. Usmani S, Marafi F, Ahmed N, Esmail A, Al Kandari F, Van den Wyngaert T, et al. Diagnostic challenge of staging metastatic bone disease in the morbidly obese patients: A Primary study evaluating the usefulness of 18F-sodium fluoride (NaF) PET-CT. Clin Nucl Med 2017;42:829-36. Jambor I, Kuisma A, Ramadan S, Huovinen R, Sandell M, Kajander S, et al. Prospective evaluation of planar bone scintigraphy, SPECT, SPECT/CT, 18F-naF PET/CT and whole body 1.5T MRI, including DWI, for the detection of bone metastases in high risk breast and prostate cancer patients: SKELETA clinical trial. Acta Oncol 2016;55:59-67.